Just a quick note, this one, to document an item that came up somewhen during my recent travels. 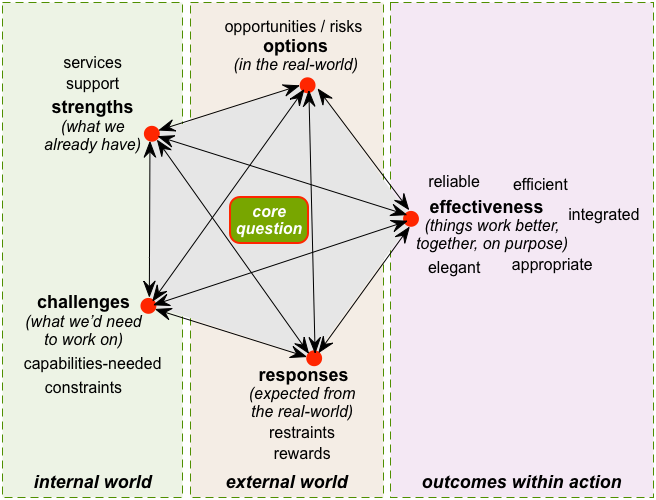 As the diagram shows, efficiency and reliability are more predictable, more ‘ordered’, and hence more easily subject to predefined rules and analysis – which is perhaps why Taylorist trained managers tend to over-focus on those themes. 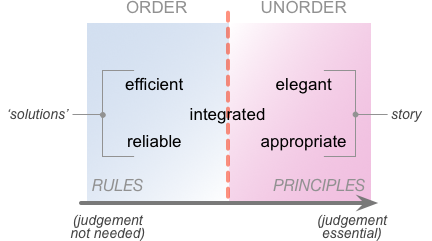 By contrast, elegance (simplicity and the like) and appropriateness (staying ‘on-purpose’) are themes that are both more blurry, more human, more ‘unordered’, and hence need to be governed more by uncertainty-friendly means such as principles and guidelines. Unsurprisingly, the final default effectiveness-theme of integration kind of sits in the middle, somewhere between all of the other themes, holding the balance between them. — When there’s an over-focus on rules and predictability, there tends also to be an over-focus on efficient and reliable – leading to a tendency to create ‘solutions’ that have little to no connection with the broader enterprise-story. — When there’s an over-focus on principles and possibility, there tends also to be an over-focus on elegant and appropriate – leading to a tendency to create a story that looks great on paper but is not actually implementable as ‘solutions’. — In each case, we need a firm emphasis on integration to provide the needed balance between ‘solutions’ (structure) and story. No particular point being made here: just thought it might be useful, that’s all. I like how the emphasis could put you into either solution or story. A great design falls in both camps. The ipod was elegant and efficient. It had a great story and a solution. It is worth noting that some of these characteristics relate to different entities – efficiency is usually about production of the “output”, reliability is about the use of the output. So, some considerations relate to outputs and some to outcomes.